Initial port to Nintendo Switch. Ported to Nintendo Switch by RagorTheUnbroken with permission from mod author Joseph Russell (Treacleman/Mythicia77). For any queries about Skyrim modding on the Switch, please post a comment or head over to our Discord﻿! 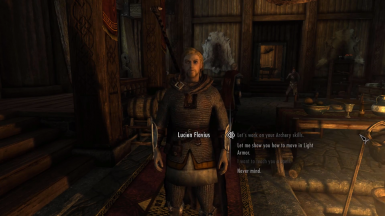 Lucien Flavius is a fully-voiced Imperial follower with over 1600 lines of immersive, lore-friendly dialogue. 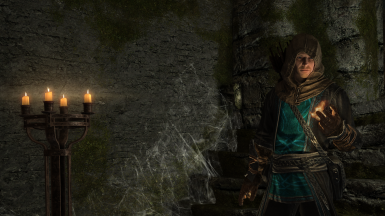 A scholar by trade, Lucien is visiting Skyrim on an expedition and may be found looking for a travelling companion in Dead Man's Drink, in Falkreath. Though he is something of a coward when you first meet him, with barely enough combat skill to hold a sword, he will dynamically learn from you as you travel together, gaining both strength and confidence until he grows into a hero in his own right. Despite his initial lack of confidence, Lucien is enthusiastic and optimistic and will comment on both your location and active quests (but will stick to whispering while you're sneaking.) He has a small pool of books he can read to you out loud, and will chat to certain NPCs during normal play. He even has custom interactions with 15 other mods, including special banter scenes with Auri and Hoth, written and recorded in collaboration with their original voice actors. Lucien has his own follower system, so does not contribute towards your follower count. He is essential while he travels with you, although should you choose, you can kill him. He starts at level 10, but will increase in skill as he travels with you until he matches your own. You can also give him lessons in particular skills to accelerate his training. Initially, he knows Frostbite, Flames and Healing, though you can teach him further spells from a select pool if you know them yourself and have a copy of the spell tome to give him. All his spells can be toggled on and off once he has learned them should you no longer wish him to cast them. His combat style is customisable, and he can fight as a warrior, mage or archer in addition to his own default all-rounder style. Over 1600 lines of fully-voiced, immersive, lore-friendly dialogue. Full commentary on Skyrim's Main Quest, the College of Winterhold questline and numerous side quests. 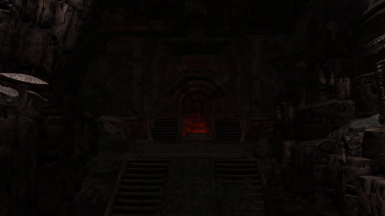 A new quest set in a unique Dwemer ruin built by Darkend creator JKrojmal. A stat-based Dynamic Personality System, where Lucien may gain or lose Approval or Bravery based on his interactions with you and the choices you make, altering his behaviour and dialogue. A custom Training System where Lucien will gradually gain levels in skills you are better than him at, accelerated by lessons in specific skills (and spells) you can give him once per in-game day. A small pool of books Lucien can read to you out loud if you have them in your inventory. 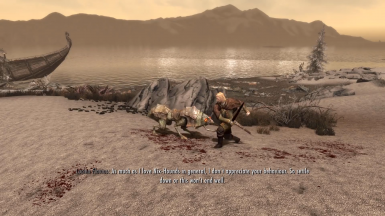 Many customisation options such as combat style and spell-toggling, configurable through dialogue or through the MCM. 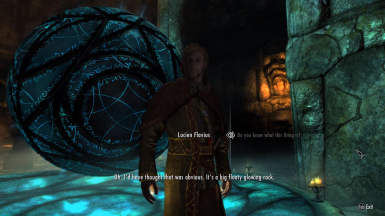 Check out the Flavius Chronicles﻿ - an ongoing series of prequel short stories set before Lucien's arrival in Skyrim! None. However, if you have SKSE64 and SkyUI, Lucien's MCM will activate, allowing you to view his stats, change his combat style and toggle his spells on and off. 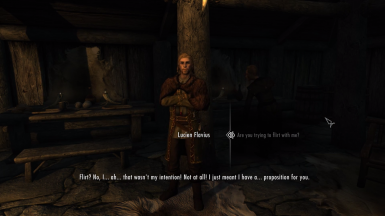 See the Mod Interaction section for details on other mods Lucien can interact with. At this stage, Lucien has no known incompatibilities. Should any emerge, I'll endeavour to patch them as soon as possible. 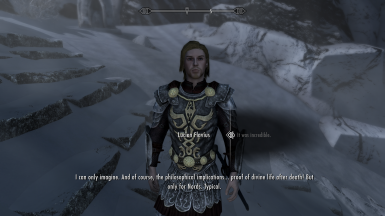 However, as he has his own custom follower system, I'd advise against trying to manage him using external follower mods such as AFT - much like Inigo, these are likely to break his brain! Download the main file and any mod-interaction patches and, preferably, activate them via a mod manager such as NMM or Vortex. If you don't use a mod manager, you can extract the esp and bsa and place them in your data folder instead. 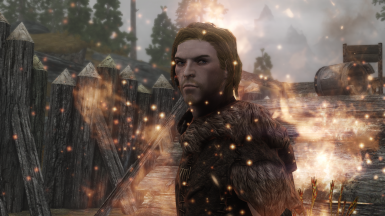 Skyrim as a rule does not support the uninstallation of a mod mid-playthrough, so I can't provide any support if doing so causes you issues. However, if you need to uninstall Lucien for whatever reason, you can do so using your mod manager or by deleting the esp and bsa from your data folder. For more info, visit the official Lucien website﻿. Q: Where do I find Lucien? 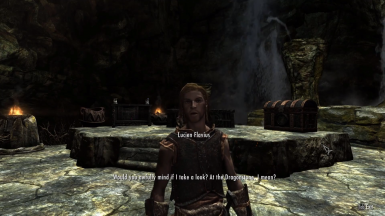 A: He's waiting for you in Dead Man's Drink, in Falkreath. Q: Can I marry him? A: Not right now. My focus so far has been on building a strong friendship between Lucien and the player. It's something I may consider in the future, though. Q: Can he ride a horse? A: Not yet, but he will be able to in a future update, hopefully soon. 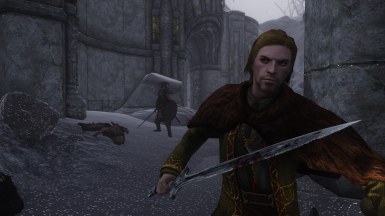 Q: Will he be available for Skyrim Legendary Edition? A: I hope so. 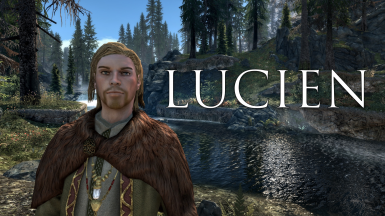 I'm working on a backport, but Lucien was developed for SE, and there is debate online about whether backporting mods is a safe practice. In any case, the Nexus SE version will always be the most up-to-date, and I'd recommend sticking with that if you have the choice. Q: How do I start Lucien's quest? A: It'll happen naturally once Lucien likes you enough. Ask him if there's anywhere in particular he'd like to see and then some time later, when he's ready, it'll be sprung upon you. A: Sorry about that - please let me know in the Bug Reports section and I'll get it fixed ASAP. Q: I have an idea for a feature Lucien should have. A: Great! Tell me all about it in the comments. 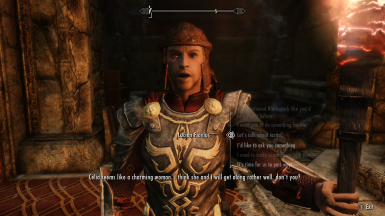 Q: I'm the modder/voice actor behind another custom-voiced follower mod and think it'd be cool if our followers could interact. A: Awesome! Send me a PM and I'd be delighted to start setting up some conversations.